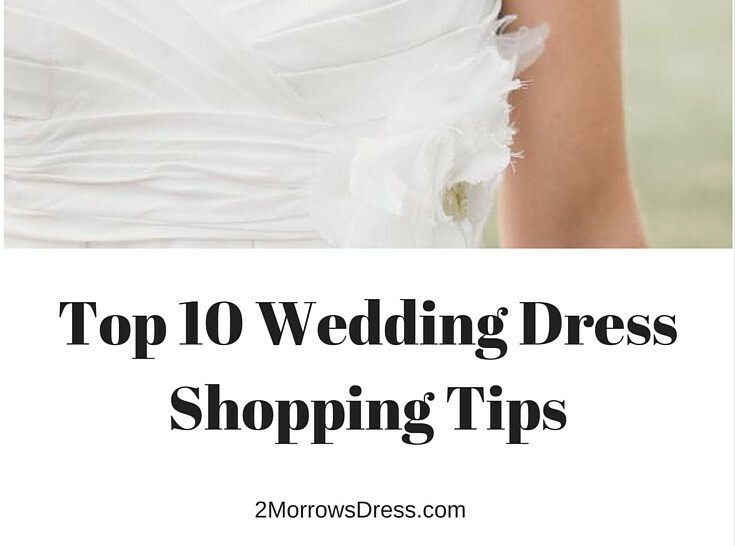 Have you ever wished that you had worn a different wedding dress, said “I do” somewhere else, or changed your hair for your wedding day? 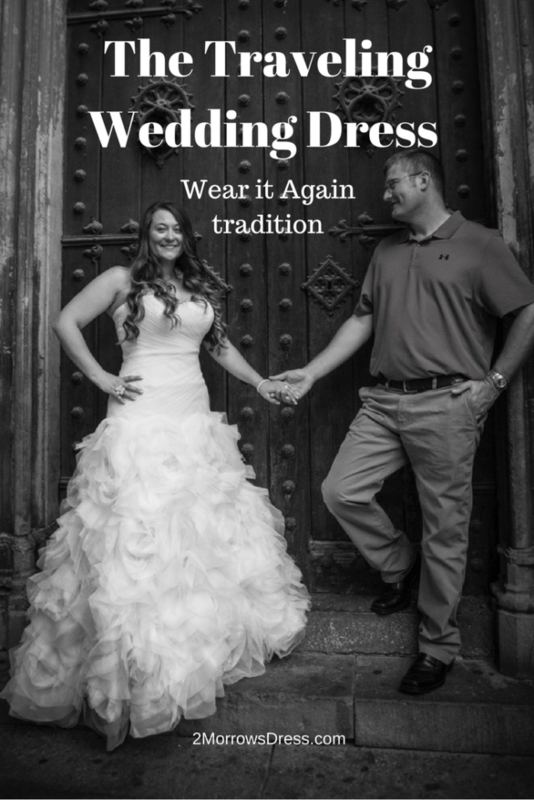 Here is the story of The Traveling Wedding Dress and how you can wear your wedding dress again! These are some of the reasons I decided to wear my wedding dress every year for our anniversary. It all started out with my son wanting to retake the wedding photos because he had started spiking his hair. There were many photos we didn’t get to take after the wedding because it came a downpour. For our first anniversary, we decided to do a photo shoot of our family in another place we had looked at for the wedding, with me wearing my wedding dress. We packed my big ‘ole dress in a tiny carry on and went to Spain for our second anniversary. We strolled through the streets of the Gothic Quarter of Barcelona and posed in front of a cathedral. We were a little more daring for our third anniversary as we took flight to Alaska and landed on a glacier for our photo shoot. That was quite the experience as everything was white and we didn’t know how far off the ground we were! The fun thing about this traveling love dress, as I call it, is we can change things up every year. For our fourth anniversary, we plan to have a photo shoot in the town of Banff in the Rocky Mountains of Canada. Future plans are on a beach, near a volcano, Iceland, and Africa! I may decide to wear a sweater with my dress, add some jewelry, or wear my hairstyle different. 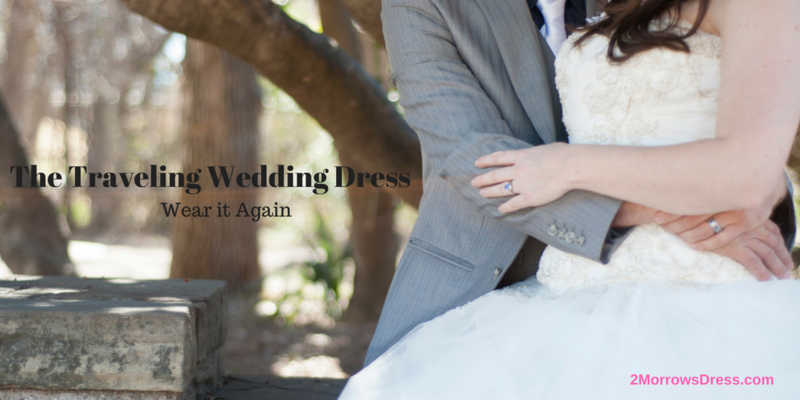 When I wear my wedding dress it reminds me of the way my husband looked at me on the happiest day of our lives. Now, I get to relive that moment every anniversary in a new destination. People ask me frequently how long I plan to do this. My question is why would I ever stop wearing that dress that makes my husband smile with his cute dimples? Guest Post: Becci shares her traveling dress story as well as her travel adventures with husband Chris and two sons. Check out even more great photos of the traveling dress on Pinterest. This is one of the coolest things I’ve ever seen. I totally would’ve done this if I didn’t sell my dress to someone else. I love how game her husband is for this as well. I know! He is so on board and seems to enjoy the traveling wedding dress adventure. It’s a really great adventure to have!